I bet many of you have faced bugs, glitches and slow performance of your mobile device. The older your phone is, the poorer performance will be. Everything becomes older and more outdated, it is not a secret. But even such things can be boosted. I'll tell you a couple tips and tricks on how to speed up a slow iPhone or iPad. I've already told you how to speed up a slow Mac. One difference between MacOS and iOS devices is that you won't be able to make any hardware upgrades. If in Mac, we can switch a hard disk drive to a solid state drive, we can do nothing with mobile gadgets. Moreover, we won't have a chance even to replace an old battery without special services' help. That's why we will pay our attention to the software options. In the majority of cases, keeping up to date with both iOS and all the apps will be useful for the best iPhone's and iPad's performance. But there are some exceptions, as with all other things. If you have an old iPhone or iPad and it is supported by the nowadays iOS, it will work slower. This happens because the software innovations that are too hard to work with for 5 year old hardware. There are even special lists of compatible devices on the Apple website. Here is a screenshot of how it looks like. A common cause for poor performance of iPhones and iPads is low storage or even no free storage on a device. 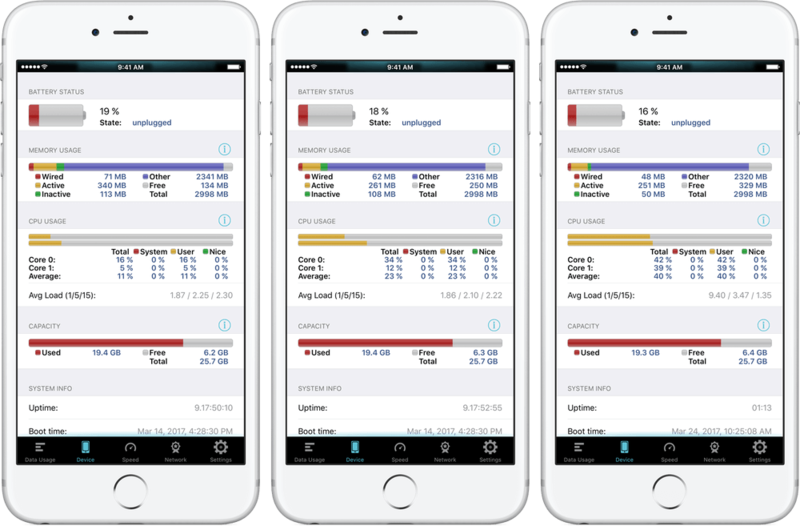 For keeping an eye on your storage, use special apps like Traffic Monitor. You can check what files eat your storage the most. Go to 'Settings', select 'General' and visit 'Storage and iCloud usage'. You can check it regularly and get rid of files that create that annoying lack of storage. How can we find out that there is actually a lack of it in another way? Crashing applications, not being able to save a photo or video, not receiving new text messages or emails, general sluggishness of your device may be signals for it. However, while you can't enlarge the storage space in your iPhone, you can use external devices for saving large multimedia files. They can also be transferred to a Mac or PC, or to iCloud. Don't worry, you won't need to monitor them as much as your files, cause iOS have a self-regulating system for coping with this task. If you want to control everything and check it by yourself, there are third-party apps that provide the information like Activity Monitor does for MacOS. Personally I use Traffic Monitor to get a detailed picture of my iPhone system resources. At the app's bottom there are tabs that show specific data for Device, Network, Data usage, Speed and Settings. This software can also deal with Apple watch and is available for iPad too. Memory usage with 15 apps launched, 20 Safari tabs and without charging during a week. Usage after closing all the apps including Safari. The situation after full powering the iPhone down. It is a sort of experiment. Look at that small memory amount freed by closing applications. Now, look at how much of them were free after powering the phone down. 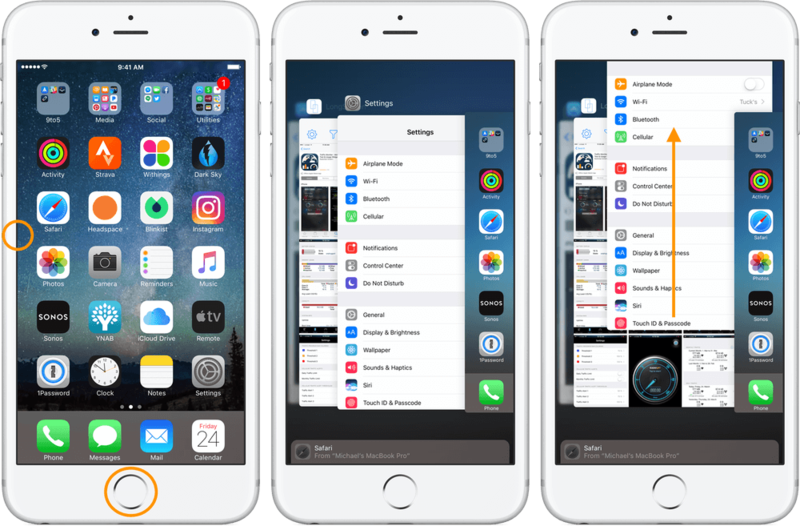 We can make a logical conclusion that powering your iOS devices down at least once a week and giving them a break will free much resources. 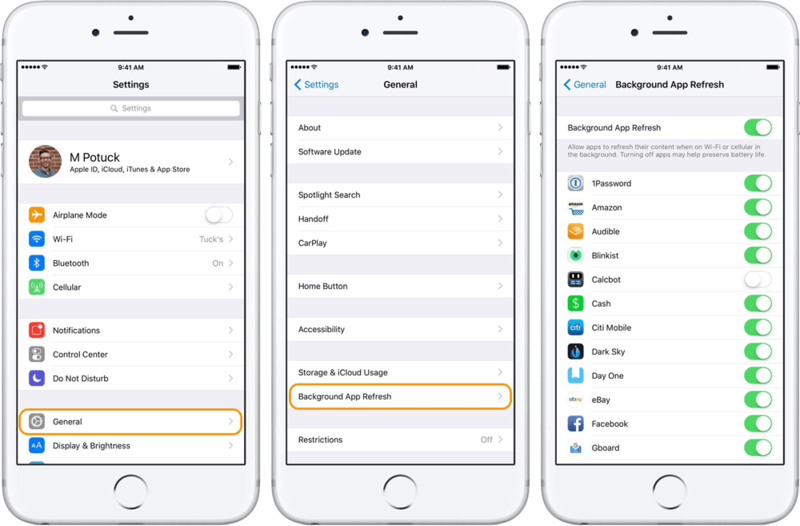 It will speed up your slow iPhone or iPad, because all the background apps will be shut down. We don't notice them usually, but they launch and continue working all the time before you get to powering your device down. In general, iOS is developed so that you don't have to think about closing applications, however, there may be cases when they become unresponsive and affect the overall performance of a smartphone or a tablet. So, rebooting a device may be a nice try to cope with this issue. Another useful feature of this app is that you can set up alerts for usage of cellular data. I have already written about it in one of my previous articles. It's important to keep an eye on cellular data not to run out of it before the next billing cycle starts. 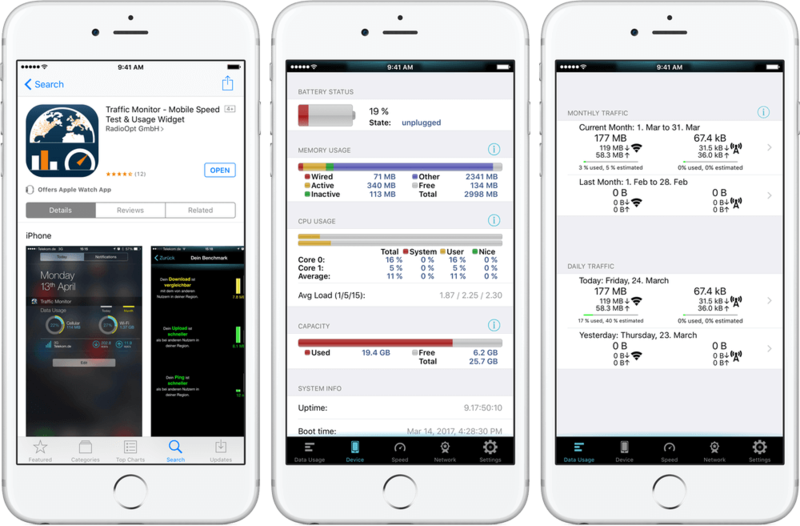 The app can also check the network speed and provide you with more system and network data. 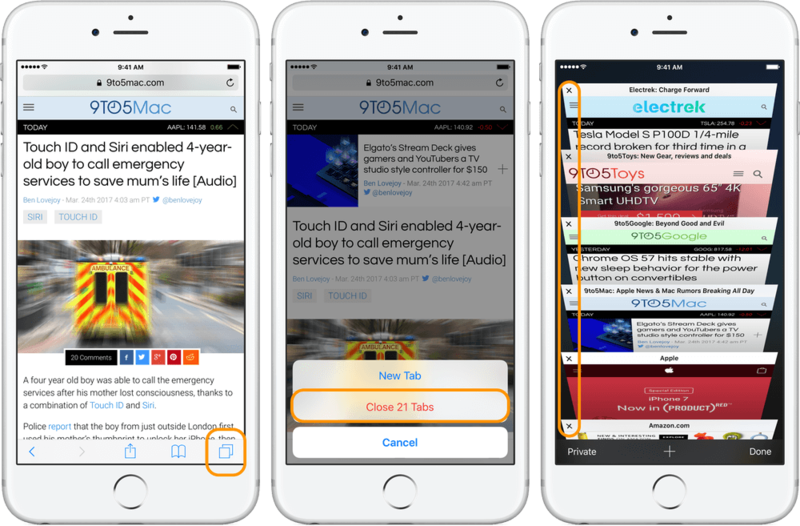 A bonus tip for you: how to close Safari tabs in a second. Long press on the 2-x square icon and the option of simultaneous closing all the tabs will appear. As an alternative, you may just tap on this icon and close each tab individually with the 'x' button in the corner. 3D touch (or firm press on 6s, 6s Plus, 7 and 7 Plus on the left of the screen). Or double-press the 'Home' button. After that, swipe unnecessary apps to quit them. Using the 'Low power' mode is one of the options for reducing the app refresh activities and other features that make your iPhone slower. It means that your phone will perform less tasks and there will be more resources to do what you want. Head to 'Settings', go to 'Battery' and select to enable 'Low power mode'. Apps like Mail and so on won't refresh automatically, so you won't receive alerts from them. However, they won't consume resources and energy of your device. You may also switch on/off apps from the list and allow them or not to refresh. Move the toggle near each app to turn off the background refresh feature. If you want to turn off all applications from background refresh, use the option at the top. There are still some tips and tricks to try. For example, you may reset 'All settings' or 'Network settings'. Navigate to the 'Settings' app, go to 'General' and select 'Reset'. I recommend resetting the network settings first. It won't remove your personal data except your Wi-Fi passwords that are already saved in your device. Try this and see whether the performance has improved. If it hasn't, try to reset all settings. This option doesn't erase your personal data as well, so you can try it without hesitation. It will just remove the Lock screen and your wallpaper. Better save them somewhere to set them up once again after resetting. It may also require customizing some settings and preferences once again. If after resetting the settings your device doesn't work well, maybe the next step you should take is restoring it. If it is okay for you, do it with your Mac or PC via iTunes. Don't forget to create a backup first. After restoring the device, bring your personal information back with the help of your previous backup. If it doesn't work either, I recommend visiting the nearest Apple store or contacting their help center for getting any advice. Please comment if you have more questions. I'll be glad to help you.